On the evening of November 19, the price of Bitcoin dropped below $5,000 – despite the fact that it exceeded $5,500 in the morning. Over the past five days, the cryptocurrency has lost about 20% of its value. At 19:15 UTC the first cryptocurrency (Bitcoin) is trading at around $4,996.72 (-11.1%). Ether (BITFINEX: ETH / USD.BITFINEX) is trading at $152.6 (-13.87%). Ripple (BITFINEX: XRP / USD) fell 4.52% to $0.487. 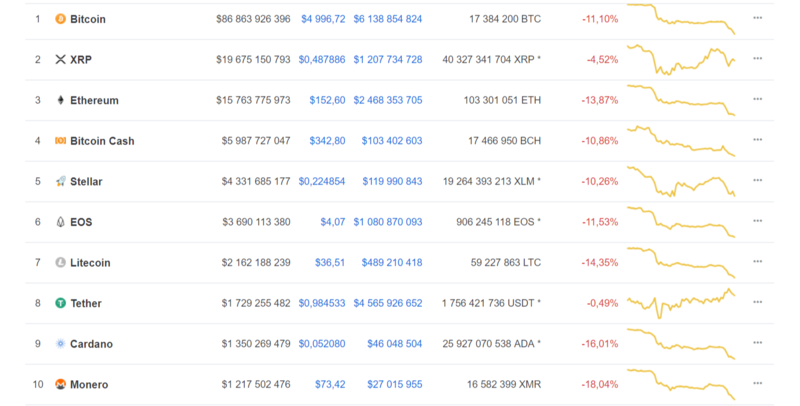 Of the top 100 largest cryptocurrencies there are only four in the green zone. The entire top ten is rapidly becoming cheaper. At the same time, Bitcoin's capitalization has updated the 13-month low, dropping to $86 billion. At the same time, the volume of stablecoin trading strongly increased. Analysts are still pushing various versions of the fall of the market. So, the main negative factor was hardfork Bitcoin Cash, which took place last week. Despite the fact that everything went well, splitting the cryptocurrency into two Blockchains – Bitcoin ABC and Bitcoin SV, destabilized the market. Investors have taken a wait, so in the absence of demand for digital assets, they continue to fall in price. Earlier, Tom Lee, co-founder of Fundstrat Global Advisors, lowered his forecast for the price of bitcoin at the end of the year from $25,000 to $15,000, which is still much higher than the cryptocurrency cost at the moment. Lee said that it is necessary to build on the “break-even point” – the level at which the cost of bitcoin mining corresponds to its trading rate. For example, for miners S9 Antminer from Bitmain, this level dropped to $7,000 from an earlier estimate of $8,000. Based on this, Lee believes that the fair value of Bitcoin will be about 2.2 times higher.